Last week marked four years since Mike and I first visited Malta together. It was Spring Break 2008 and Mike flew me to Malta, where he was doing a university exchange, to visit him for a week (pretty romantic, right?) I returned to visit for two months in April, and the rest, as they say, is history. Why Malta? His exchange options were Iceland, Stockholm, Copenhagen, Helsinki, the UK, and Malta. It's no surprise that a sunny Mediterranean island seemed more appealing to Mike than going further north than Halifax for the winter. And in hindsight, he made an excellent choice. ghajn tuffieha - our favourite beach back then. and my favourite ever dress from zara. i was reading the complete works of austen. once a nerd, always a nerd. 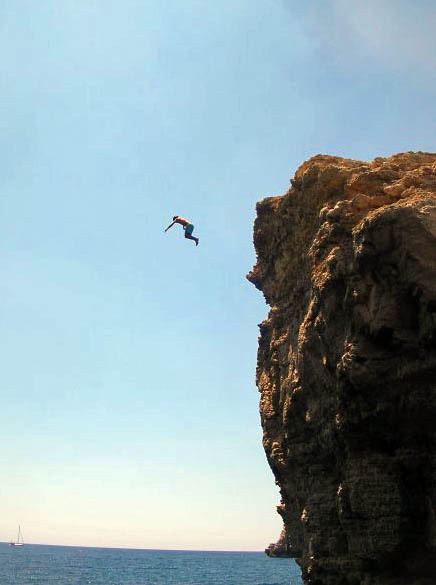 once a cliff jumper, always a cliff jumper. Wow, looks so beautiful there. You guys are lucky! seriously speaking, you two are one of the most handsome couples i've ever seen! the glowing skin, the hair, the tans--crikey, you're gorgeous! Oh my gosh, this looks amazing! It looks like such an idyllic place, and you two are an adorable couple! wow, that's a big cliff jump! oh man, Malta is definitely on my must-visit list now! everything looks so beautiful! Mike made a good choice - as much as I love the more northerly parts of Europe, there's just something magical about the Mediterranean.